I read this post by my bloggy friend Lara over at The Golden Seven some time ago, and I immediately knew that I wanted to follow her example. To celebrate turning 37 earlier this year, Laura did 37 random acts of service/kindness to others. 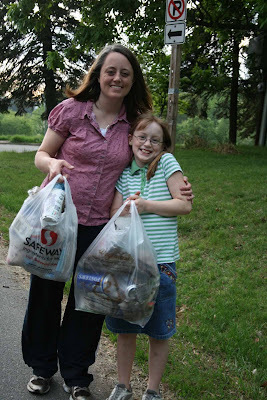 She picked up trash with her daughter, gave money to a homeless person, mailed a letter to a friend, paid for the car behind her in a drive-through, taped exact change to vending machines, and left candy bars and even gift certificates on the cars of perfect strangers. I have thought about this project a lot over the last few months, and with my birthday coming up in October, I am wondering how I can work this into my life. I am trying to scale back my "projects", but this one combines my two favorite things: Service & Birthdays! It's a no-brainer! I will, however, have to serve in my own way, since I am of limited time and means. I will let you know how it goes, though. And if you try this out, please let me know about your experience as well! Wow what and awesome idea! I think I might just try that! Thanks for the post! Love that idea but I am going to be 44 this year. I will have to start right now with my 44 acts of random kindness! Doesn't being a mom count for like 20 of those? Definitely an awesome idea. I'm only 24 so I think I'll give it a try now before I get any older someday, seriously! Lovely post! wonderful idea but I just turned 70 today. How about 70 smiles at people I don't know? What a neat idea! I find myself so much happier when I choose to start service projects. Too bad we have to be reminded huh? This sounds like the perfect way to celebrate your birthday! Great idea! I'd love to hear what you come up with. what a good idea. This is a fabulous idea! About 7 years ago, I started devoting the week of my birthday to service... The first year I lived in a small college town, and was a student at that college. Many of my friends and I woke up really early and left thank you signs on all of the restaurants that put up with all of us crazy young adults :)... the businesses left them up the remainder of the year, and my friends and I drew closer to each other as we did something hard together... waking up at 5:00 in the morning! :D We also did other things that week, such as Temple work, serving those in our community, giving thank you gifts and the passing around the "star service stickers",(this worked really well at our college that year! If you are interested in the "star service stickers" visit my blog kandefam.blogspot.com in a few days. I'll have it posted there. It was so much fun for everyone. Just know, I am new to the world of blog so it's nothing fancy.) Quite honestly, those weeks of service in the past 7 years have blessed my life I think more than it has the lives of anyone else. And you truly learn to love those who you serve. I just got an invitation to a birthday party. The woman who's having the birthday is asking that no one bring gifts & instead bring something for the local food bank. I thought it was a fabulous idea! I missed this post, but how awesome! I need to think of 36 young things to do!